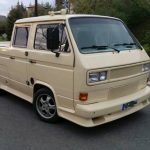 The Gentleman's Charging Station | BlackBerry Blast! 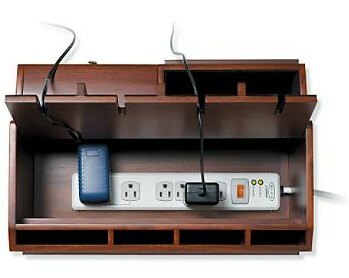 Keep your nightstand organized with this Mahogany Charging Station. Frontgate has introduced a Mahogany Charging Station for the gentleman's gentleman. 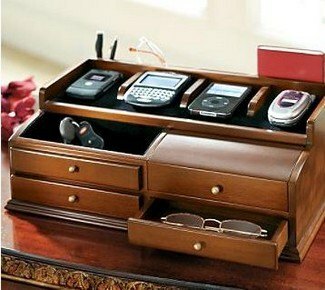 Instead of housing expensive cigars, gold plated cuff links, Rolex watches and the like, this Mahogany charging station carries your gadgets. Yes, even Prince Charles and Donald Trump are sure to have a gadget or two. This mahogany charging station has slots to hold your phones and music players while they charge. Under the hood is a power strip to plug in all of your gadgets. The Mahogany Charging Station will be available on February 5, 2007 for $149.